While I was at South By Southwest in March, I fell hard for Casa del Fuego, a late-night taco truck parked in downtown Austin. The soft tacos were simple – just chicken, cheese, cilantro and onions in a corn tortilla. Since then, I’ve been on the search for tacos like that in Memphis. On the recommendation of my friend Stacey, I drove out to Hickory Hill to try Tacos Borolas for lunch. The menu is loaded with authentic Mexican snacks. The tacos are $1.75 each, and they come with your choice of meat: spicy pork, Mexican sausage, tripe, beef tongue, beef tripe or steak. My spicy pork taco came to the table naked, but I added cilantro, onions and lime juice from a tray that the waitress brought over. 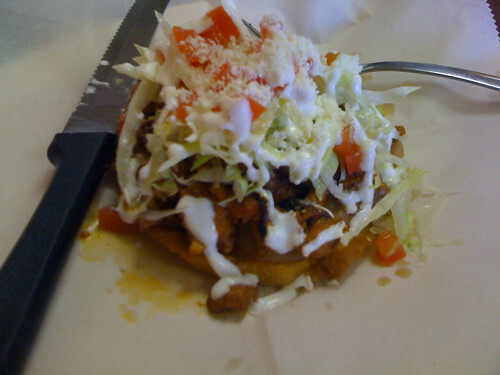 I also tried a spicy pork sope, a thick tortilla loaded with beans, meat, cheese, lettuce, tomatoes and sour cream. If you’re going for atmosphere, Tacos Borolas probably won’t be the place for you. The decor is a little sparse, but the staff is completely friendly and the food is inexpensive (the total for my meal and drink was $6.28). Tacos Borolas is open daily from 9 a.m. (they have breakfast!) to 9 p.m. On Friday and Saturday nights, they’re open until 11 p.m. For dessert, stop by Panaderia de Ilusion, the bakery / party supply shop next door. Not to be overly pedantic, and not that these sorts of things are ever really set in stone, but that’s more Parkway Village than Hickory Hill. My wife and I moved back to Memphis from Texas a few weeks ago and have been looking for this style of Mexican food. Can’t wait to give it a try! Those looked good; I just wish they had goat as an option. So far, I’ve only been able to find goat tacos and burritos at Guadulupana. They do have shrimp and ceviche. There’s a fairly new place called El Mercadito on Stage Rd. where the old Lone Star steakhouse used to be. I’ve been there a couple times now and they have some very good meals. Homemade salsa that is great. They have a dish just like the taco you described. It’s basically 3 different tacos with 3 different meats on it. basically comes with the cilantro, onions, and I think a little bit of cheese like in your other picture. Served with rice and beans. Fantastic! Their lunch specials are very reasonable too. I think $5.99 gets a choice of their dishes with drink included. All the tacos at Tacos Borolas were fantastic. LOVED the steak and chorizo tacos. There IS chicken and shrimp to be had, ask the waitress. All the staff was very nice and helpful. I want to try the cubano asap. I’m loving Delicias too. You can get their guac from the farmers market for fairly cheap, it’s really really good. Will be trying "Tacos Borolas" today. 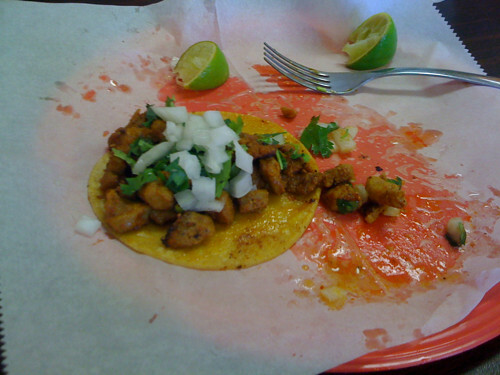 We love "Las Delicias", it is the best taqueria we have found in Memphis. But willing to give it a try to "Borolas". I hope it will be a good experience.